Although the journey to this nature reserve and the terrain you will meet when you get there are not for the faint-hearted, it is more than worth the effort. You will be rewarded with views of some of the most beautiful scenery in Wales to distract you along the way. 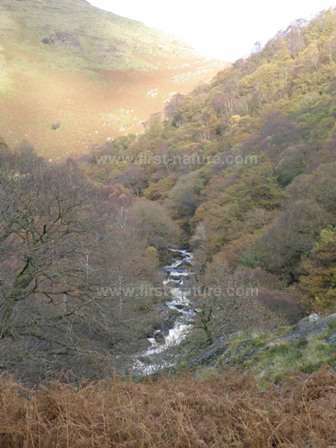 Allt Rhyd y Groes NNR, and the surrounding area of the Cwm Doethie/Mynydd Mallen SAC, consist in part of Sessile Oak woodlands clinging to death-defying steep gorges through which rush numerous small streams and some larger rivers, including the River Towy which is itself an SAC river. But there are other important habitats in the area, too, including rocky heathland, grasslands and bogs, all of which support their share of rare and special wildlife species including birds. Red Kites (Milvus milvus), Peregrine Falcons (Falco peregrinus) and Merlins (Falco columbarius) all breed in the area. Considerable damage has been done to this glorious landscape in the past including the introduction of conifer plantations, the creation of a reservoir, and in particular the draining of bogs for agricultural purposesto allow for ever-increasing populations of sheep. Nevertheless, the protection afforded to this particularly beautiful Welsh landscape by its special designations, and the resulting management plans, should help to protecct and restore it for future generations of plants, animals and people to live in and to enjoy. The site is managed by Natural Resources Wales (NRW). From the A40 in Llandovery turn onto the A483 in the direction of Builth Wells, and then after 200m (180yds) turn left on the road signed to Cilycwm, Rhandirmyn and Llyn Brianne. 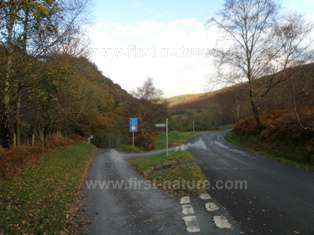 Continue along this road past the village of Rhandirmwyn, and look out for the junction (pictured on the right) towards Troedrhiw, where you should bear left. Cross over a concrete river bridge, and then continue along the narrow lane, which has a few passing places, for approximately 1km (2/3 mile) until you come to another river bridge on the right, and a farm gateway (pictured below left) which is the entry path to the nature reserve, immediately in front of you. If travelling by car, please drive over the bridge and park on the firm verge some 50 metres further on and well out of the way of large farm and forestry vehicles that may need to cross the bridge from time to time. Walk up the track, keeping the river on your right. There are various tracks into the wooded area on your left. The track from the gated entrance, pictured left, is good, but once you get into the woodland, the paths are slippery and muddy in wet weather. There are no maintained tracks outside the wooded area, and there are some steep climbs over tricky ground if you want to get up to the heath and grassland areas and to see the wealth of mosses, ferns and lichens clinging to the rocks and trees on the way up. There are no facilites at the reserve, but there is a tearoom on the road from Llandovery to the reserve, and also public toilets, cafés and shops in Llandovery itself. This whole area is a great place to see Bluebells (Hyacinthoides non-scripta) and so a visit in late May or early June would be a good time to see one of the great sights of the Welsh countryside. 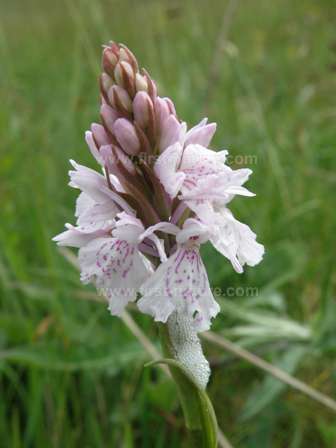 Other plants that grow in the Reserve include Great Burnet (Sanguisorba officinalis), Devil's-bit Scabious (Succisa pratensis), Pignut (Conopodium majus), Wood Anemone (Anemone nemorosa), Bilberry (Vaccinium myrtillus), and in the grasslands, Heath Spotted-orchid (Dactylorhiza maculata). Trees in the woodland, other than Sessile Oak, include Rowan and Hazel. If you are interested in bryophytes, Allt Rhyd y Groes is one of the best places in South Wales to go and see mosses and liverworts (as well as many lichens) that cling to the rocks and trees. This kind of humid habitat, created by the spray from the rivers rushing through the gorges and trapped by the dense tree canopies that prevent the water from evaporating, are ideal for so-called lower plant species, and this NNR has some very rare species. The woodlands have excellent birdlife, and many typical woodland species are seen in Allt Rhyd y Groes including Chiffchaffs (Phylloscopus collybita), Redstarts (Phoenicurus phoenicurus), Pied Flycatchers (Ficedula hypoleuca), Blackcaps (Sylvia atricapilla) and Wood Warblers (Phylloscopus sibilatrix). If you are lucky you might catch a glimpse of a Treecreeper (Certhia familaris) or a Great Spotted Woodpecker (Dendrocopos major) here, too. Up in the heath and grassland areas there are Northern Wheatears (Oenanthe oenanthe), Whinchats (Saxicola rubetra), Meadow Pipits (Anthus pratensis), and a bird seldom seen in this part of Wales, the Green Woodpecker (Picus viridis). Overhead the crying of Buzzards (Buteo buteo) and Red Kites (Milvus milvus) can be heard. Along the rivers you may catch sight of a Kingfisher (Alcedo atthis), or a few Dippers (Cinclus cinclus) squabbling among themselves or standing on rocks bobbingup and down as they search for signs of food (such as insect larvae) below the surface of the water. Insect life is good in the humid woodland and not only feeds the resident and visiting birds, but also bats that emerge to hunt above the streams and rivers in the evenings. Up in the heathland the larvae of Small Tortoiseshell, Red Admiral, Green Hairstreak and Peacock butterflies benefit from the plantlife.